Lincoln City was originally five small communities. This is the final article in our series regarding the roots of Lincoln City and explores Nelscott and its intriguing history. Early Nelcott was remote and densely forested with spruce and hemlock. The Dawes Act of 1887 provided free land to new colonists and Siletz tribal members, but few took the government up on their offer. Among the adventurous were Charles P. Nelson and Dr. W.G. Scott, developers looking for land in the early 1900s. Nelson first came to see the area around 1906 and the two men later returned to buy. Many parcels of relatively flat land with beach access offered development promise. The two men combined surnames and formed a new partnership firm: the Nelscott Land Company. The area remained mostly inaccessible until the construction of the Roosevelt Military Highway (Highway 101) in the 1920s. Automobiles were affordable by the 1920s and travelers found the drive down the new Oregon Coast Highway almost irresistible. Suddenly, motoring tourists flocked to the area in droves and an economic boom ensued in the area. Nelscott’s development was relatively small compared to others along the coast. The Nelscott Land Company subdivided their property into 87 small lots for small vacation cottages. The company wanted to create a small summer resort town, not a massive development. Scott and Nelson wanted a wholesome environment for visitors. They outlawed public halls and taverns and the community operated on coal oil lamps. Even when a diesel-powered generator arrived on the property in 1926, it was shut down at ten o’clock every night. Early Nelscott catered to motorists and tried to entice campers to the area. The Nelscott Auto Park was basically an elaborate campground, which accommodated 100 tent campers at the height of the automobile craze. It offered tent houses for fifty cents a day. The Nelscott Cash Store built in 1927 had a general store, bus depot, gas station, and restaurant. It was so busy during the summer that six clerks sometimes staffed the store. Photos of the auto park and store are courtesy of the North Lincoln County Historical Museum. Eventually, travelers wearied of camping in tents and business owners offered cabins instead. Modern private cabins rented for $1.50 to $3.50 per day completely furnished and with hot and cold showers. Visitors could also partake in pony rides, Friday night entertainment, and church services. The Great Depression and World War II eventually brought tourism to a halt. Blackouts after sundown, rationing, and the migration to the coast for employment stunted growth during these periods of uncertainty. Despite these hardships, people remained in the area. However, the rise in modern hotels and new state parks meant few people stayed in tourist cottages or tents. A 1939 directory recorded only seventy-one residents and by 1950 there were just 180. Nelscott never incorporated and when given the option to amalgamate with Oceanlake, DeLake, Cutler City, and Taft, residents voted 85 in favor and 57 against. 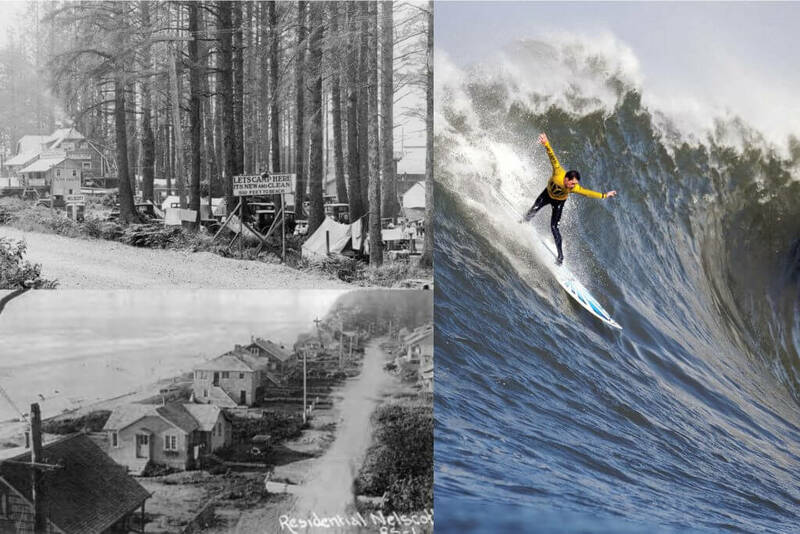 In 1964, all five communities became Lincoln City for improved fire, water, and sewage services. You can find the Nelscott area north of Spanish Head. Fashionable beach houses line the coast and the Nelscott Strip offers shops and diners. Nelscott is most well-known for its stunning beaches and the Nelscott Reef, home to world-class big wave surfing competitions. It was named as one of the Pacific’s best surf locations in Surfer Magazine in 2003, and home to the Nelscott Reef Big Wave Pro-Am in Lincoln City. If you’re interested in exploring historic Nelscott, why not stay in a comfortable Lincoln City oceanfront vacation home with stunning ocean views and high-end amenities. These well-appointed condominiums offer stunning ocean views, HDTV, wireless internet, an exercise room, a heated indoor pool and a games room, and more. You’re perfectly positioned to explore the Pacific Coast Scenic Byway and all the Oregon Coast has to offer, without sacrificing comfort or affordability. This is the fourth article in our series regarding the roots of Lincoln City. This article focuses on Cutler City, one of the five original communities of Lincoln City, each with an interesting past. The Dawes Act of 1887 opened up the Oregon coast to settlers. It provided acreages to new colonists and Siletz tribal members. The promise of free land drew people to the area, but getting there was another matter. North Lincoln County homesteaders used the old Salmon River route to travel in the area, but it was little more than a trail. It followed the Salmon River, rocky slopes and passed through very deep forest. The abundance of timber and the access to the river made it the ideal spot for the lumber industry, but the road was barely passable and only during the dry seasons of the year. It was hardly an attractive prospect for settlers traveling with all their worldly possessions. Nonetheless, settlers did arrive. The first non-natives came to Drift Creek in 1896, and by 1905 the first sawmill appeared. Even after many road improvements, the area was still almost inaccessible. You could reach it on horseback, by boat, or by wading across the water at low tide. A swinging foot bridge across Schooner Creek improved access by 1911. The Cutlers from Dallas, Oregon were the first to purchase land in the area and by 1913 the Lincoln County Court approved the Cutler City town site. Within the next decade, a dairy also appeared near Drift Creek, but the lack of a passable road limited the population. This all changed with the completion of the Roosevelt Military Highway in 1927, linking all Oregon coast cities. The area was suddenly connected to the surge of automobiles traveling on the newly built highway. Automobile camping soared during the 20’s and by 1930 the town had the official name Cutler City, an archway at its entrance, and its own auto park with picturesque cottages. 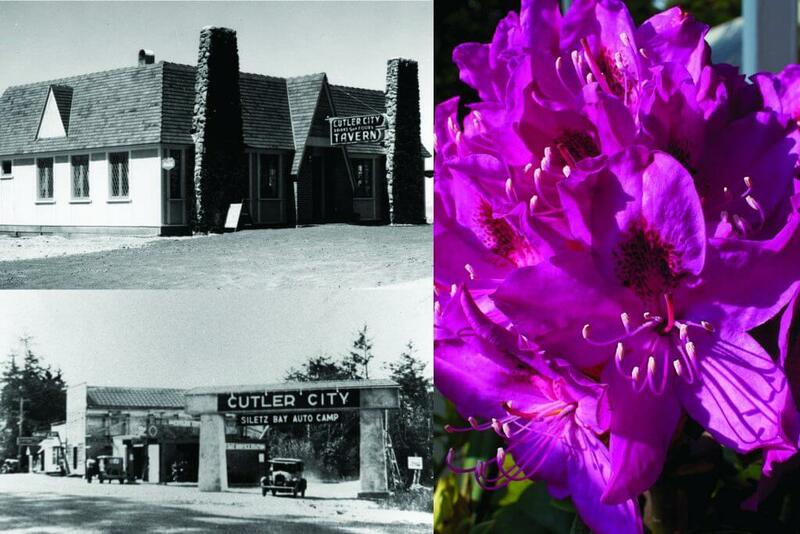 Cutler City became known for its stunning rhododendrons and the ideal getaway for a vacation. Consequently, vacation cottages sprang up with picturesque views and quaint gardens. The town progressed slowly through the Great Depression, bringing new residents and new businesses to the area. The start of World War II brought development to a standstill. Gasoline shortages and blackouts quashed the tourist industry and any events designed to entice people to the area. However, the lumber industry continued to flourish due to the need for timber throughout the war. The end of World War II triggered an economic boom in the U.S., and Cutler City came to life again. The population doubled and many new businesses appeared. Cutler City was less affluent than many other towns, but it had a strong, proud, independent working class community. When discussions began regarding amalgamating Oceanlake, Taft, Nelscott, Delake, and Cutler City residents were reluctant and skeptical. When the proposal final won approval in 1965, Cutler City’s vote was only 73 yes and 69 no, hardly a landslide. Regardless, Cutler City became Lincoln City along with the other communities. Old Cutler City lies between Schooner and Drift Creeks. It is primarily residential, but a few notable historic buildings still stand. The Cutler City Tavern (photo courtesy North Lincoln County Historical Museum) is now the Bay House and the Kangas Brothers Dairy Barn still echo Cutler City’s early days, although they’ve undergone renovations. You’ll also find antique shops, an art gallery, and the relaxing Josephine Young Memorial Park if you need to unwind. If you’re interested in exploring historic Cutler City, why not stay in a comfortable Lincoln City beach rental with stunning ocean views and high-end amenities. These well-appointed condominiums offer stunning ocean views and high-end amenities including HDTV, wireless internet, an exercise room, a heated indoor pool and a games room, just to name a few.